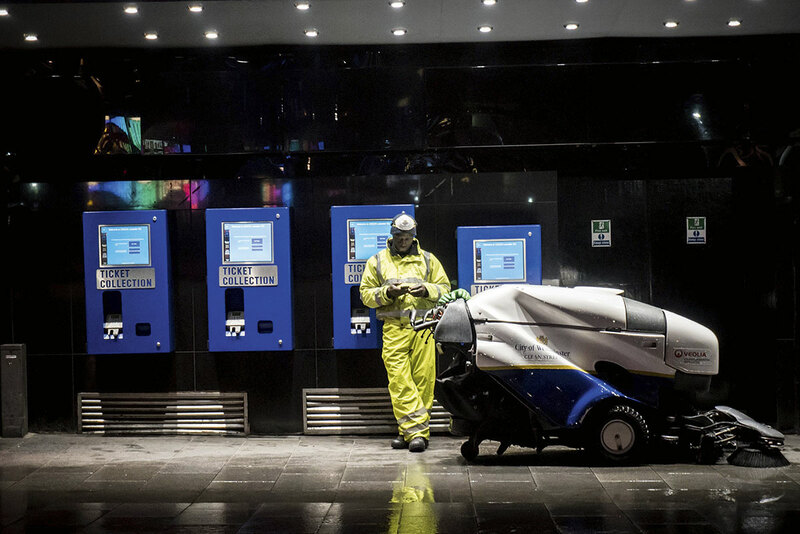 There are people out there working away to keep the world running while we sleep, yet there’s something strangely peaceful about this night-time world. It’s amazing how a city can transform from the crowded, loud, frenetic place that it is during the day, to an empty and eerily quiet shell at night. This series of images found me shooting between the hours of 8pm and 5am. Often I would try to get a couple of shoots in during a night – after completing a day’s work as a staff press photographer for South West News Service (SWNS). The important thing with this project was that I not only wanted to focus on a broad spectrum of subjects, but I also wanted to capture subjects who would be visually interesting. 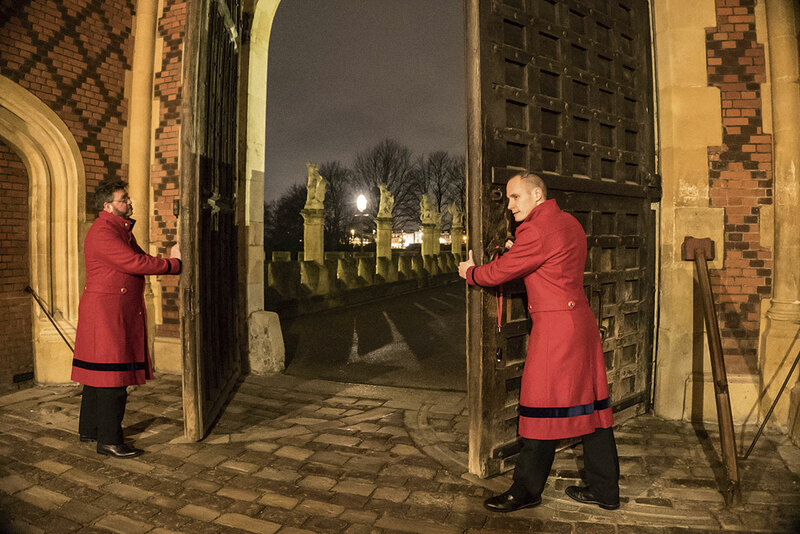 For example, in Bristol I photographed an engineer working on a train in a depot, while in London I focused on door guards at Hampton Court Palace. 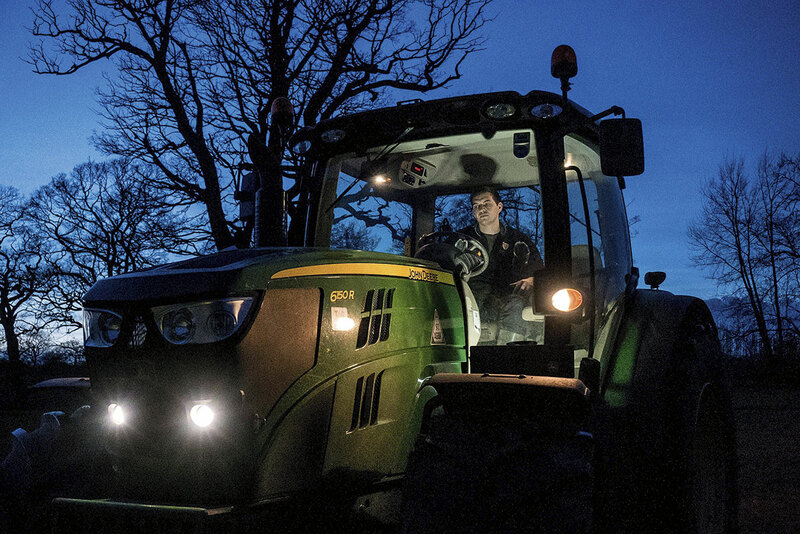 Not wanting just to prioritise city workers, I also headed out to the countryside and photographed a farmer on his tractor working late into the night (see below). I had to approach the people I photographed in different ways, depending on their profession. Usually, as in my day job, I much prefer capturing natural, candid moments, as they are a truer reflection of a subject. If people are unaware of the camera being there, they don’t feel the need to play up to it, or shy away. The professions that required more access, such as the train engineer, inevitably had more planning to the shoot than the street cleaner in London, which was completely spontaneous, but this was mainly due to health and safety issues. 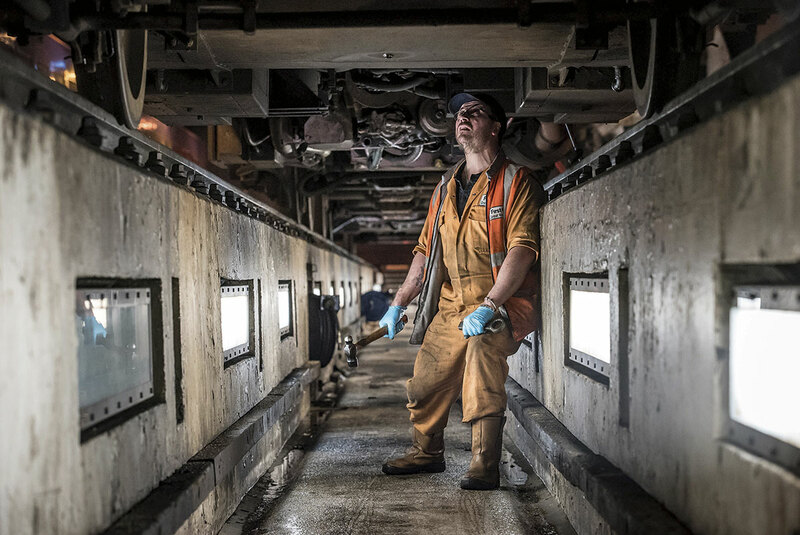 Once I was in the train depot with the engineer, I could capture candid moments as the staff went about their night shift. I shot this project using a Sony Alpha 7S, because I needed a camera that would be quite forgiving in low-light conditions. It’s a much smaller camera than I’m used to working with, which was the first positive point as it meant I could just pop it in a large coat pocket when not using it. The articulated screen was also a nice change from my Canon DSLR cameras as it allowed me to get a different perspective on subjects and still accurately compose the shot. The camera was stunning in low light and allowed me to capture scenes that would have usually required extra lighting, or at the very least a tripod and long exposure. But as I was able to bump the ISO up to 409,600, it allowed me to practically see in the dark. For most of the scenes, I used ISO ratings between 6400 and 12,800 with no problems at all. The main upside of this was that I didn’t need to shoot using flash. Working with available light is usually what I do for work anyway, but it was nice to almost not have to worry about light levels, as I could push the ISO quite high. The only shot where additional light was added was with the image of the farmer, when I placed a small LED light in the cabin to balance the exposure with the setting sun. Other than that, it was all ambient. The main consideration I had to make in terms of exposure was to try to keep the shadows as clean as possible. Often the night scenes were lit by a single source, such as a street light or a working light, which just meant keeping an eye on those shadows and trying to find a good compromise between noise and shutter speed. Taking my time with each subject was important. Working as a press photographer has taught me to shoot around a subject quite heavily. The newspapers always want a variety of crops and expressions, such as landscape, portrait and so on, so they can place an image onto the page easily. Therefore, with each person in this project I got a full set of pictures (maybe 20) and then whittled them down a bit further in the edit. I find that with this type of project a set works well, as you can decide post-shoot which photos work best next to another set of images and edit accordingly. When shooting a photo essay, you need to ensure that you do your best to portray your subject in a truthful way. Shooting candidly is often a great way of doing this, as limiting your input into the scene will create a more natural frame. I have a mental checklist when shooting around a subject. I think: do I have a head shot, a medium close-up and a full-length picture, and am I showing the subject in their environment? But of course that sort of checklist can go out the window, as the situation is fluid and often unplanned. You need to be able to adapt and go with the flow. However, if you’re looking to capture your subject in a single shot, then you need to keep in mind that a portrait should sum up that person in that single frame. This could involve placing the subject in a relevant environment, the expression on their face or the tonality and mood of the image. All these aspects can contribute towards a successful portrait. People often ask me to define exactly what I do. Am I a press photographer, a documentary photographer or a photojournalist? I think in many ways I am a documentary photographer, but I think my official title has to be press photographer. This title incorporates many aspects of the documentary practice, but just places it into a tight news deadline. But in my opinion, the aim of documentary photography and press photography is to tell a story of a person or place, and get it out to a wider audience to raise awareness or tell an interesting story. I’ve always been interested in photography, but it all really kicked off when I decided to do a degree in it at Plymouth University in Devon. I had a great three years there, and they let me have the freedom to do my own projects and pursue any news stories I wanted – so long as I got my work in on time! While at Plymouth Uni, I started turning up to news events and filing pictures to London News Pictures. I kept bumping into SWNS photographers on these jobs and when a position became available there I went for it. It all tied in rather nicely with finishing university, and I’ve been at SWNS ever since, which is around four years now. Working for an agency is tough. The hours are long and you are often waiting around for ages for stories to evolve. But the job also gives you the most amazing access to places and interesting subjects to photograph. From photographing Dolly Parton in her tour bus at Glastonbury Festival, to soaring above the city at the Bristol Balloon Fiesta, I’ve had a great time and have been lucky enough to photograph some interesting things. No two days are ever the same. I feel really privileged to have received the Young Photographer Bursary and Videographer of the Year awards at the 2013 UK Picture Editors’ Guild Awards. It’s great to know that picture editors are appreciating your work, but it’s by no means why anyone does press photography. I think you really have to live and breathe photography in this job. It takes up so much of your time – day and night. But awards are always lovely to have, and the prize money helped me do another exciting project in the US.